In accordance with the farmer's rules of ancient Roman provinces, players settle the fertile land with their houses. However, even the most luxurious houses are worthless without a reliable water supply. If a player does not supply his houses with water before the region they are in is completely developed, the residents â€“ good or bad â€“ must leave and the house does not hear the player any points. The player who best uses clever tactics â€“ along with a little luck â€“ to place wells and canals at the right time while securing the best building spaces, will outmaneuver their opponents and win the game! 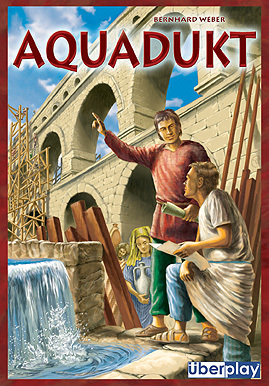 Aquadukt is a tile laying game where you try to score points by placing buildings and ensuring a water supply to them. This second dimension of supplying water is what Aquadukt special, since the water supply is done with communal wells and canals, which opens a lot of opportunities for (unintentionally) helping and (deliberately)hindering your opponents. This makes for a great competitive game that rewards taking chances at the right time.